The “Mount Rushmore of ________” is a tired construct at this point, but still serves a decent enough purpose: Trying to winnow down a presumably deep category to its four best examples can be a worthwhile exercise. When I think of my personal ranking of the four best television dramas ever, I find myself putting Mad Men at the top of the “also receiving votes” table. Mad Men has always faced a greater degree of difficulty than most of the other names that crack the list. Whereas the drama in, say, Breaking Bad includes literal life-or-death stakes, Mad Men is more of an examination of the relatable parts of our lives. It incorporates universal themes of identity, career, and family, and places them in a context that also melds those concepts to a cultural analysis of American history. While that examination is part of what makes the show fascinating, there’s no doubt that it’s inherently easier to make a compelling television show about drug deals and murders than it is to make one about pitch meetings for now-defunct fast-food restaurants. Yet, Mad Men has remained compelling more often than not, despite its focus on elements that aren’t so different from our own lives. In fact, I’ve always thought the show is at its weakest when it veers into more far-fetched territory. Which brings us to Sunday night. Unlike other great television dramas, Mad Men doesn’t seem destined for a definitive conclusion. Whereas shows like The Sopranos or Breaking Bad or Lost or The Shield each defined a central conflict over the course of its last season, Mad Men, by its nature, has no such opportunity for make-or-break resolution. It seems fairly obvious that the writers have already dealt with the fate of certain characters. Pete and Trudy have come full circle. Joan ultimately decided that the work conditions she endured weren’t worth it when love was waiting. Betty is dying of cancer. Peggy seems destined to be running McCann by 1980. Roger is a man who simply doesn’t have a place in the world anymore. Predictably and appropriately, Sunday night will revolve around Don. How much of his destiny we see remains to be seen. The conclusion may be open-ended, or we may actually witness the moment of his death, whether that takes place in 1970 or after a time-jump. Lots of theories about what happens to him have surfaced. One—that Don is D. B. Cooper—was so intriguing that the usually secretive Matthew Weiner felt the need to deny it specifically. If I’m to hazard a guess, I point to two key things that have happened this season. The first is Don’s obsession with Diana, or, more generally, with the idea of escape. Diana’s revelation that she uprooted herself and abandoned her daughter only served to intensify Don’s interest in her. When she disappears, he goes to Wisconsin to find information about her. I get the sense that his interest in her is less sexual / lust and more about the fact that she was able to break all familial ties for the sake of starting over elsewhere, something to which Don both relates and is vexed by. What’s more, when Don continues across the country, he encounters young, small-town crook Andy. He tries putting Andy on the right path just as he reveals much of his own thought process about the decisions he made nearly two decades earlier. Don also seems to have these thoughts at the front of his brain, indicating that he’s probably planning (or at least weighing) another big escape. Things pointing in that direction is also probably part of what prompted the latest round of D. B. Cooper speculation. Put bluntly, I get the sense that Don Draper is basically finished with being Don Draper. His marriage(s) are kaput. His interest in working for McCann seems to be nil. And, of course, he wasn’t really Don Draper in the first place. But there’s one other subtle moment in last week’s episode that I thought was critical. Stranded at a hotel due to car trouble, the proprietor asks Don (who has shown himself to be handy) if he’ll fix the Coke machine in exchange for an additional free night at the establishment. After a brief exchange in which Don notes that this is one of the older-style machines, he looks at the device and seems to have a silent moment of revelation. Nothing more is said about the machine. There are several possible interpretations, but the one that occurred to me is that whatever part of Don’s brain has that gift for advertising (really, a gift for understanding humans and how they interact with consumer culture) suddenly has a Coke-related epiphany. At least that’s what I’m hoping. Because I’m bracing myself for an “unsatisfying” finale. That’s the nature of Mad Men. These people live their lives, wading through vaguely recognizable situations and relationships set against a backdrop of familiar history. We gain a little insight along the way if we’re lucky, but the stories don’t resolve in a clean way that makes you think, “Ah, now it all fits together” the same way that a show like Breaking Bad did. In the end, Mad Men wasn’t really about history any more than an old photo album of your parents when they were young was about history. History was important but ultimately incidental. It was simply the medium through which these characters navigated their lives. In the end, Mad Men was more about its stories’ and characters’ similarities to our own lives in 2015 than it was about the differences. The contrast of history just made the universality of those connections more apparent. Sometimes, just like real life, outcomes aren’t wildly dramatic or exciting or shocking. But they do ring true. That’s why I’m not expecting to get a happy ending for Don. Don is a broken man who never truly recovered from his horrific childhood. One of the seminal moments during that time in his life was witnessing his family’s treatment of a hobo during the Depression. I think there’s a part of Don that never let go of a fascination with the nomadic life, one free of commitments and relationships, since those had provided him with so much pain in his formative years. Yet, I still think about that staring contest with the Coke machine. 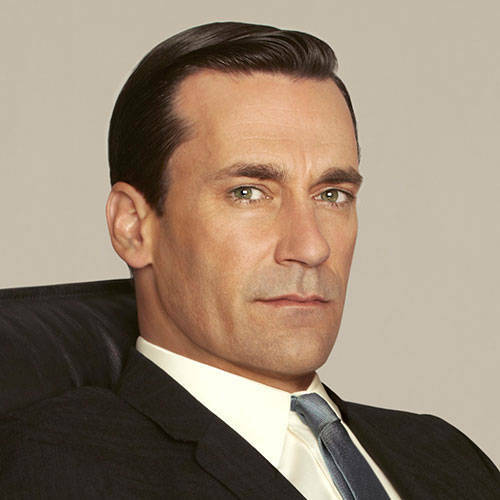 I can’t help but wonder if we’ll all be treated to one final, grand stroke of Don Draper brilliance, as he saunters into the McCann boardroom like nothing is amiss and delivers the greatest unsolicited ad pitch in history for Coca-Cola. Then he just leaves. Probably to start over somewhere else as someone else. It seems like a fitting end to a great series. Not a happy ending. Not an ending where he finally finds love. Not a suicide reminiscent of the show’s opening credits (that may be reserved for Roger, we’ll see). Not even a delightful ending wherein we see a revitalized Don dominating the advertising world of the 1980s. Instead, an ending befitting of a damaged, imperfect, man prone to alarmingly frequent hallucinations, whose pain bestowed upon him a unique insight into humanity. Giving us one final glimpse of that brilliance, then disappearing without a trace, seems like the right way to end Don’s story. This entry was posted in Commentary, Television and tagged AMC, Commentary, Don Draper, Joan Harris, Mad Men, Peggy Olson, Pete Campbell, Roger Sterling, Television. Bookmark the permalink. 1 Response to At the End, What Do We Make of Mad Men?